When Hurricane Michael roared through the Florida panhandle on Wednesday, October 11th, it left the worst devastation the United States has experienced in a storm in nearly 50 years. This record-breaking storm left a monumental impact. As destroyed homes are being discovered, hundreds of thousands are stranded without power, and more is yet to come. Our thoughts and prayers go out to all those suffering from this tragic storm. 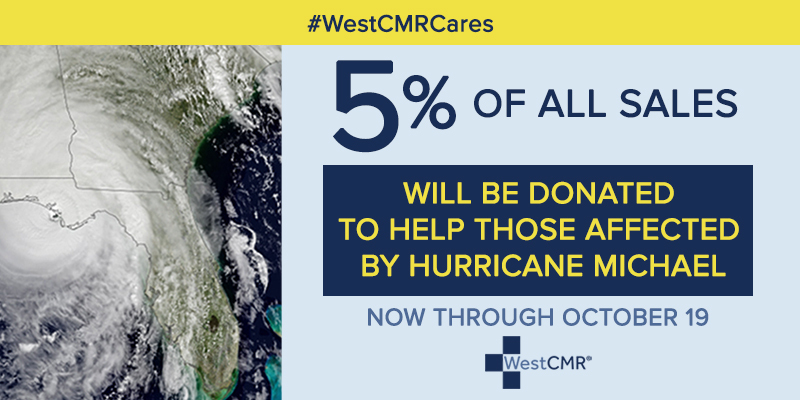 As an organization, WestCMR and GeoSurgical are bound together by our support and passion for helping others and the environment, and we understand how imperative it is to assist those in need in our home state of Florida, and around the world. We express our gratitude to every individual who reaches out to offer relief efforts. As a reflection of our philanthropic commitment to helping others, we are donating a percentage of all of our proceeds to assist those left in Michael’s path. Starting today through Friday, October 19, WestCMR and GeoSurgical will be donating 5% of all sales to fund Hurricane Michael relief efforts. This is a time where not only our WestCMR family is able to make a difference, but our customers can as well. Please help us help others. Thank you.